Thai soups feature incredible flavors and are ultra comforting — guaranteed to lift your spirits and brighten your mood. These soups make a satisfying dinner, and they're the perfect remedy for chasing away a cold or flu bug. From world-famous Tom Yum soup to Thai-style chicken noodle and vegetarian soups, you'll find all of the best soup recipes right here. Sip, slurp and enjoy! 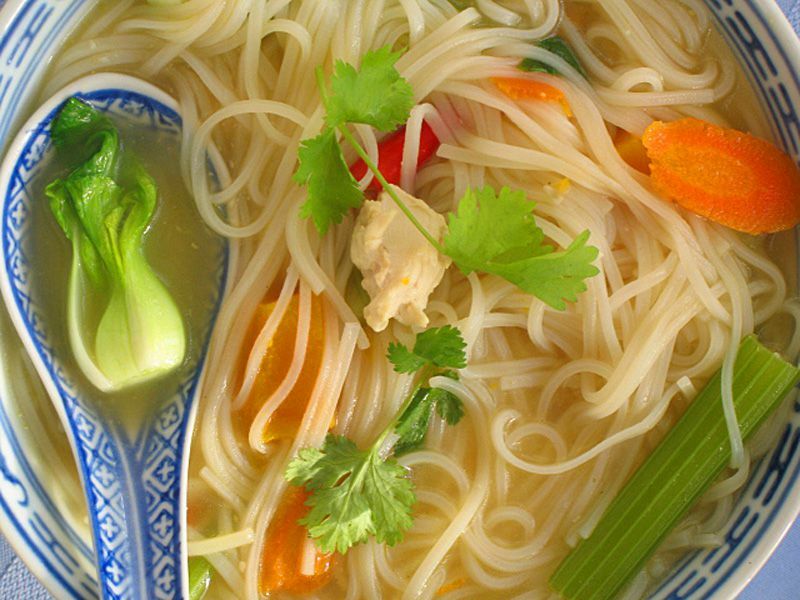 Try this fantastic chicken noodle soup recipe from the Thai kitchen! If you like chicken noodle soup, you'll love this fragrant version of a universal classic. Made with rice noodles instead of wheat, this Thai chicken noodle recipe is lighter in calories, gluten-free and also much healthier than your typical chicken noodle soup; it's also far more delicious! Great if you're fighting off a cold or flu bug, or anytime you want a bowl of comfort. There are lots of imitations out there, so be sure to try this traditional recipe. It will melt away your worries and cares with its intoxicating mix of lemongrass, lime and coconut milk. This is a very healthy soup as well. It will boost both your mood and your immune system, leaving you feeling warm and energized. This soup is one of our all-time favorites, and it also happens to be vegetarian, vegan, and gluten-free, which makes it perfect for anyone you happen to be cooking for. We had this soup after visiting the mountain region of nearby Malaysia. It was cold and rainy the whole trip, and when we got back, this soup seemed to have great appeal. As soon as we tasted the hot broth, we felt the chilliness melting away and oh, it was so soothing! It's the combination of lemongrass and coconut milk that makes it, and the addition of rice noodles makes for an added bonus. In Thailand, pumpkin and coconut milk are commonly paired up to make a variety of both savory and sweet entrees. In this recipe, the two come together beautifully in a lightly curried soup that tastes as delicious as those you may have tried at your favorite Thai restaurant. This vegetarian version of Tom Yum Soup is easy to make, plus it's just as delicious and healthy (if not more so!) than the original recipe. Make this easy soup today as an appetizer, for lunch or as a nutritionally complete dinner. You'll love how it warms you up from the inside! Hot and Sour Soup is similar to Tom Yum Soup but has a delightfully different flavor. It relies on egg instead of coconut milk to thicken it, shredding into beautiful white egg "clouds." This recipe includes lots of greens, plus shrimp or mixed shellfish. If you prefer, this soup can also be made with chicken or tofu. A great soup whether you're fighting a cold or flu or are simply craving some warm comfort food. Thai Chicken Soup (Tom Ka Gai) has that distinctive Thai flavor — a balance of spicy, salty, sweet and sour. You will especially welcome this soup's warmth during the fall and winter when it can also provide you with added health benefits, helping to ward off cold and flu bugs. Tom Ka Gai can either be served as an appetizer or as the star player (noodles can be added if you're planning to make this soup as a main entree). So sip, slurp and enjoy the soothing warmth this soup brings! This special Thai soup is based on an ancient recipe from the Central Plains region of Thailand, where rice, fish, and vegetables are the common local ingredients. It is a fiery-hot soup with both sour and sweet overtones that make for a lively combination, especially when paired with fish and/or seafood. For this recipe, we've used both shrimp and fish fillets. Plenty of fresh local vegetables are another characteristic of this wonderful Thai soup recipe. Feel free to vary these ingredients according to what is fresh and good at your local market or grocery store. This fabulous pumpkin soup is healthy, flavorful and mood enhancing! Perfect for the fall or winter, this warming soup recipe features pumpkin or squash paired with shrimp and/or chunks of fish (any type of white fish fillets will work) plus some healthy greens. Instead of cream, this Thai soup calls for coconut milk, which aside from being lower in calories and fat than cream, also pairs beautifully with the taste of the pumpkin or squash, making for a delicious soup that is also extremely healthy. This dumpling soup recipe is the perfect comfort food any night of the week! The dumplings are easily assembled using wonton wrappers (wrapping instructions included). A variety of nutritious vegetables are then added — as many or few as you like — together with a chicken-lemongrass broth. Make it anytime you're in the mood for some soothing comfort.